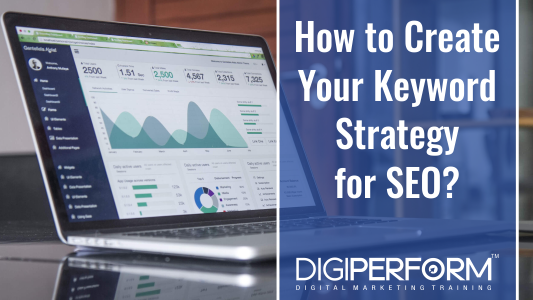 Digiperform > Blog > Business & Digital Marketing Tips > How to create Your Keyword Strategy for SEO? How to create Your Keyword Strategy for SEO? No matter how many algorithm updates Google rolls out, it is still evident that keyword research remains a big task for inbound marketers. As more and more people join the online platforms and hit search engines with search terms, the need for bettering the keyword research skills keeps rising. Website owners must now be very intentional with meeting the needs of the target audience. Given the nature of competition that goes on online, brands must think of a strong keyword strategy that they can execute to push their brand forward in the right direction. Any keyword strategy will work by considering the search volume of data as the number one metric to measure. With the initial goal of getting to find the search terms that your target audience is keying in on search boxes, this metric comes quite in handy. Ideally, where there is smoke, there is fire. In this case, if a search term has a high search volume, then you must assume that it is a popular query. Whatever keyword planner tool you are using, it is possible to highlight the search terms that are more popular than others. This can only mean that they are pointers to the most common search queries at the time. Some people have relied on Google’s Keyword Planner to help with identifying the search volume data as the underlying metric for setting up their SEO keyword strategy. It is one thing for you to take up a popular term, but it is another different thing to be relevant in responding to the search queries. Regardless of the search volume of a keyword, if you are unable to understand what the user’s intent was, it is highly unlikely that you will adequately address the query with a relevant response. For every keyword, there is the literal meaning and the underlying meaning, based on the context it has been used. For this one, use Google as your refuge. Once you have identified the search terms, you would want to use on your copy, before you can use them, run them through Google search engine. The idea is to get the top five results populating Page 1 of Google, and featured snippets that are on the page. For the websites that are ranking top for those keywords, the nature of the information they share should more or less be the benchmark to which you generate content. It is very likely that the sites are still ranking for those target words because they accurately capture the intent of the search terms. On another note, keep your keywords long instead of short. The chain of words, of about 4 or more, are more descriptive than single-word keywords. With long-tail keywords, you better capture the intent of the users more than with short-tail terms. This is a more advanced metric for your keyword strategy that matters a lot. There are tons of website that share the same industry as you. This means that the possibility of them targeting the same keywords you are is very high. In that case, you need to consider how competitive the terms you want to work with are. If the competition is too high, then it makes it very difficult for your site to show up in SERP results, which means your content will not receive significant organic traffic from search results. As you consider the search intent from Google’s SERP, analyze the sites in different categories, i.e. Does the site rank for other related terms in your industry? Does the site have a higher domain authority than yours? Is the website focused on commercial or informational content? Is the brand related to the keyword topic? In understanding this, then you can weigh whether the keywords are as competitive as you presume them to be. However, you will also need the help of a competitor research keyword tool like KWFinder, Moz Keyword Explorer, SpyFu, among others. The best way around very competitive keywords is through using related search terms. The good thing with words is that they are flexible enough so that you can say something in many different ways. Using related keywords is also a fresh idea to reach out to the needs of your target audience while capturing a broader audience base with your initial seed keywords. Further, it is a great way to avoid keyword stuffing your copies with one particular keyword. The simplest way to find related search terms is through Google. When you plug in a keyword in Google’s search box, there are a ton of keywords suggested for the word you are typing in. Consider the results at the bottom of the Google result page. Understanding how your competitors are faring in matters of keyword research (or through competitor analysis) will help you build a strong SEO keyword strategy. For one, since they are sharing the same industry as you, and probably targeting the same target market, their choices would make a difference for your brand. You need to be especially particular with the competitors that are performing a lot better than your brand on SERP. However, it is also true that, just because a keyword is important to your competitor, doesn’t mean it’s important to you. You only want to consider their performance for the keywords you are interested in, and for the keywords, they are performing great at. Look into their keyword strategy, how they satisfy the needs of their audience, and how well they integrate their keywords in the content they generate. On a side note, do not ignore the keywords that your competitors are not targeting, but are on your list. You can use them strategically to win over the market share for those unique search terms. As you do this and continue to borrow their strategies on the shared keywords, you gain a substantial competitive advantage over them. It’s time to stop stuffing any or every keyword in volumes in your content. Ideal keyword density should be followed by 1-3% of the total content. Using the right keywords in your strategy can be valuable to your business. SEO is a complex marketing strategy and there is no one-size-fits-all strategy, but there are ideal result oriented practices that can be implemented to provide consistent results. Hii, First of all, I would like to thank you for such a wonderful and informative blog. One of the best article I have read until now. Great explanation and I clearly understood each and every point.